The many health and beauty benefits of using sweet almond oil have been known for thousands of years and it has been used to promote a healthy skin, hair and face. In fact, sweet almond oil has been used in medicine in the Middle East and South Asia for centuries and is also a part of Traditional Chinese Medicine (TCM). But, it is only relatively recently that scientific research has backed up some of these health benefits. The good news is that there are many ways that you can enjoy sweet almond oil. Sweet domesticated almond that we can buy in our supermarkets. Sweet almond oil has many antioxidant properties and is rich in vitamin E which has many health benefits. It also contains vitamin K which is important to effective blood clotting and bone health. In addition to that, it is also a good source of monounsaturated fatty acids, which are known to have many benefits to the heart1. The sweet almond nut contains about 50% of oil, which is extracted, and it can be used both internally and externally. Sweet almond oil and bitter almond oil shouldn’t be confused. Bitter almonds and the oil that is extracted from them are highly toxic and can even be fatal if consumed. Although bitter almond oil can be used safely on the skin, it is best to keep away from it because of its harmful effects if swallowed. On the other hand, sweet almond oil comes from the same almonds that you buy in the store and which are used in cooking, baking, and confectionery. You can use sweet almond oil in a number of ways. For example, in meal preparation, you can use it in place of olive oil for a delicious salad dressing, or it can be used externally for your hair and skin. You can massage it straight onto the skin and scalp for a relaxing rub or mix it with other ingredients to make a cleansing facial scrub. Sweet almond oil is great for your face and skin because it is rich in vitamin E, which is both an antioxidant and nutrient. In fact, most skin care products advertise the fact that their products contain vitamin E. Almond oil has been traditionally used by massage therapists to moisturize the skin during a massage session, and is probably the most common base oil for skin care. The oil is a great moisturizer when it is applied directly onto the skin because it doesn’t clog pores and quickly absorbs into the skin. If you prefer a different scent, then why not add a few drops of your favorite essential oils? This can be used as part of your daily skin care routine. You can find more information about it in my article about the best essential oils for skincare and in my e-book Magical Aromatherapy. The oil is also perfect to moisturize a baby’s skin as it is 100% natural, mild, and hypoallergenic. Sweet almond oil is very effective in opening up the skin pores, thus making it a great skin cleanser. It is also a very mild oil and can even be used by people who have sensitive skin. You can use it as a makeup remover – All you have to do is massage some oil directly onto the skin using a cotton pad and leave for 2 minutes. After that, wipe off the makeup with a clean cotton pad. As part of your weekly facial cleansing routine, you can mix some sweet almond oil with fine sugar to make a natural facial scrub. Almond oil is very effective when treating skin conditions like eczema, UV damage, and acne. Eczema makes the skin dry and itchy and it can start to blister, weep or peel. These sores can then become infected. The soothing antioxidant properties of sweet almond oil can relieve the itching and heal the skin. To nourish the skin and ease the discomfort of eczema you can use the oil on its own. However, for better results, you can mix it with jojoba oil which will leave a protective layer on the skin. Because it is mixed with almond oil, the jojoba oil is better tolerated by people with sensitive skin. Another idea is to add a few drops of essential oils for eczema to your almond oil. The cleansing properties of sweet almond oil are also effective against acne and can help to prevent blackheads acne flare-ups. The fatty acids also help dissolve excessive amounts of sebum, one of the causes of acne. Research published in the Journal of Cosmetic Dermatology showed almond oil can not only protect against harmful UV radiation but also reverse its effects3. In clinical studies, mice were exposed to the equivalent amount of sun which we have in a regular summer. The mice which had been treated with almond oil showed significantly fewer signs of skin damage than those with no protection. 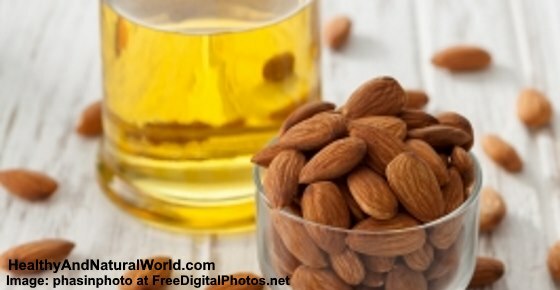 Sweet almond oil is also effective in reducing the visible appearance of wrinkles. The vitamin E and the moisturizing properties of almond oil, as well as its proteins and amino acids, boost the production of collagen. This makes the skin appear younger and smoother. You can find more information in my article about the best oils to combat wrinkles naturally. If you have dark circles and puffy eyes, almond oil can help you. Apply a few drops of almond oil around the eyes at night time before going to bed and massage with a circular motion. Make sure to apply almond oil regularly to reduce dark circles and puffy eyes. Sweet almond oil is great for your hair. It is rich in magnesium, vitamins and fatty acids that can nourish your hair and even assist in hair growth. Almonds and almond oil contain a high amount of magnesium. One of the reasons for hair thinning is a magnesium and zinc deficiency in the body4. So, by regularly massaging sweet almond oil onto to your scalp, you can help boost hair growth and prevent further hair loss. The vitamins and fatty acids in almond oil also help nourish the hair. So by regularly applying almond oil to your scalp and hair, you feed your hair with all the nutrients that it needs. The effects are stronger, shinier hair with fewer split ends and frizz. The benefits of sweet almond oil aren’t just restricted to your skin. It can be effective in treating and relieving a number of other health-related conditions. Almonds and sweet almond oil, when combined with a healthy diet can help reduce cholesterol and lower the risk of heart disease. The British Journal of Nutrition carried out research and showed that a diet containing almonds and other nuts reduced LDL cholesterol (bad cholesterol) after only 2 weeks5. It also showed that the antioxidant effects of vitamin E also reduced the risk of heart disease. Another study6 showed that both whole almonds and almond oil effectively reduce harmful cholesterol (LDL), and increase the good cholesterol, or HDL, which may reduce cardiovascular risk. Sweet almond oil is used as a folk treatment to help digestive issues in the lower digestive tract, including constipation, as it has a mild laxative effect. If a person suffers from constipation, then 2 tablespoons of sweet almond oil will work as a natural laxative and provide the needed relief. If you are now wanting to incorporate sweet almond oil in a well-balanced nutritious diet then it is very easy to do. Cold-pressed almond oil (labeled ‘food grade’ like this one) has a low smoke point (the temperature at which an oil starts to get damaged) hence is not ideal for cooking dishes that require high heat, but you can add sweet almond oil to salad dressings, marinades, and even to smoothies. As with all fats, though, it should be consumed in moderation as it contains around 120 calories per tablespoon. Sweet almond oil can be bought online (opt for organic almond oil like this one) or it can be found in many large supermarkets. Please remember that only sweet almond oil should be consumed, never bitter almond oil. No – I had a look at this brand and it’s not pure almond oil. It’s 77% Mineral Oil, 21.2% Vegetable oil (including sweet almond oil), 1.8% combination of: Vitamin E, Perfume, TBHQ, Chemical Ingredients 12740 & 12150.